You can help VBF raise awareness for vascular birthmarks and build a supportive community. Your personal story, photo or video might ease the worry of a new mother, inspire a father to seek earlier treatment, or give new hope to an adult or family who has been struggling with how to manage a difficult birthmark. Every birthmark is unique, so every person has a unique experience. We want to hear yours! Share your family’s story using the form below or by emailing kristin.vbf@gmail.com. 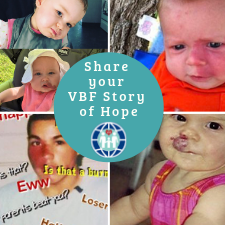 Tell us how you became involved with VBF and why you feel it’s important to raise awareness. Fill out the form below to get started. A member of our team will contact you to share your story. We look forward to hearing from you! Join Our Mailing List for latest developments, updates, support, and other information from VBF. You can opt-out at any time.